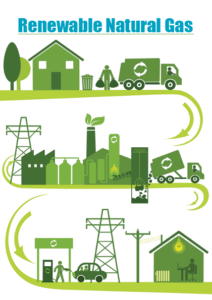 Throughout our conversations with Dealers, Fleets, and Strategic Partners across the United States, one question that often arises is “What is Renewable Natural Gas or RNG?” It’s certainly a good question and one that deserves some further clarification as to how it differs from the traditional natural gas we’re more familiar with. The Coalition for Renewable Natural Gas serves as the public policy advocate and education platform for the Renewable Natural Gas industry in North America. We found a very helpful article that gives a great overview of RNG. Recently, UPS announced an Agreement to purchase 11.5 million gallons of RNG which will be used at various locations throughout the US. In an article by Greenbiz.com released today, it’s stated that “burning RNG instead of conventional diesel reduces lifecycle greenhouse-gas emissions by 90%”. Additionally, this article indicates that since 2014, RNG has really taken off. US production for RNG vehicles reached 189 million gallons in 2016 – nearly SIX TIMES the volume produced in 2014. Its consumption is continuing to grow and RNG is all the buzz. Are you looking to learn more about RNG and the deployment of Natural Gas Vehicles within your fleet? https://www.landiusa.com/wp-content/uploads/2017/04/landirenzo.png 0 0 admin https://www.landiusa.com/wp-content/uploads/2017/04/landirenzo.png admin2017-12-04 09:43:022017-12-04 09:43:02Is Your Fleet Utilizing the Benefits of Renewable Natural Gas (RNG)?